red onion and cubed provolone cheese. 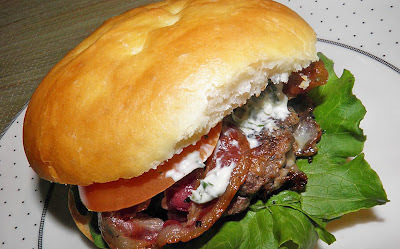 It is topped with fried pancetta and basil mayonnaise. Here's another "illustrated guide, how-to" for you all. It's Wednesday, so the weekend will be upon us before we know it. As far as I know the weather will cooperate here in Nova Scotia and if so many of us will be grilling. 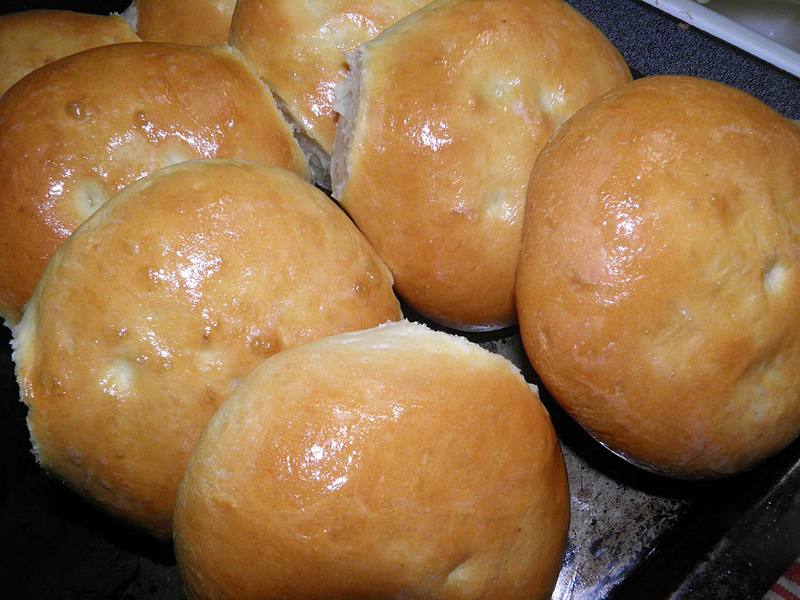 Why not try homemade hamburger buns? They're really easy. I posted about homemade hot dog/hamburger buns earlier (here), but they took a sourdough starter. The drawback was extra time, the benefit that they kept fresh a little longer… Bread without a starter usually goes stale in 24-48 hours. Case in point, French baguettes – mad fresh every day – and delicious. These buns can be done in one day – even one morning or afternoon. So no need to pre-plan if you're a "spur of the moment" type of person. 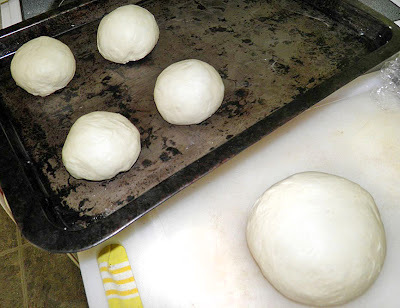 As far as yield, if you cut the dough into 8 portions you get larger sized buns. 12 portions will yield "normal" sized buns. Therefore it's easy to use this same recipe for crowds of different sizes. on the top is from my finger testing it. It is not at all a "firm" stiff dough. Left: half the dough divided into balls; right: piece remaining to be cut. 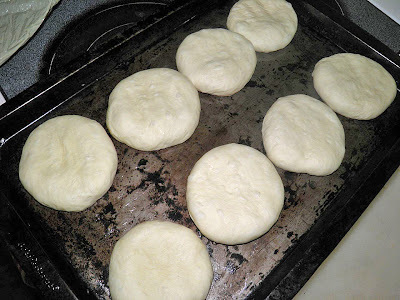 if you're making 8 or 12 buns. Each ball is flattened into a round for the second rise. Warm the milk, water and butter on the stove to between 110°F and 115°F. Use a thermometer. Any hotter and the liquid will kill the yeast, and any lower temperature will slow down the activation time. Ready to go into the oven. The tops have been slightly dimpled with my fingertips. This helps the buns go "out" as opposed to "up". We don't want balls for buns. Knead briefly, for about 1 minute to bring it all together. 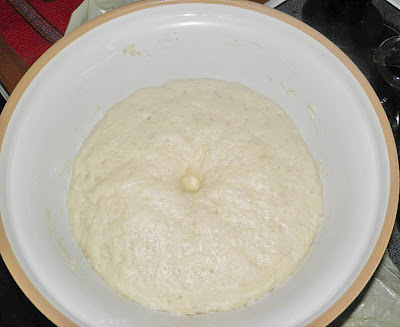 Place the dough back in the bowl. Cover with plastic wrap and a tea towel. Let rise in the warmth (like outside in 85° sunshine…) for 2 hours, until doubled in book. Mine actually formed gas bubbles on the surface. Grease a cookie sheet(s) with butter and divide the dough into 8 or 12 equal balls. Place each ball on the sheet and flatten out. Let them rise for 30 minutes. 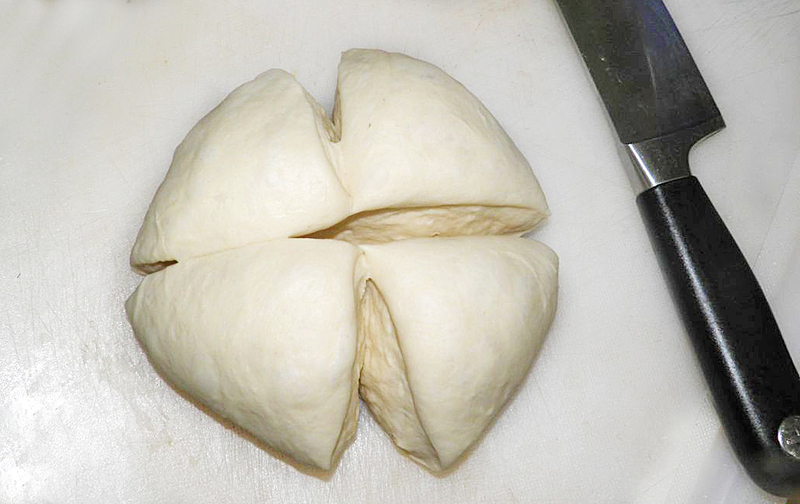 Dimple the dough slightly with your fingertips just before placing in the oven. Bake at 400°F for 20-25 minutes. I found the lower time worked fine. Rub the tops with butter to keep them soft. If you want crustier buns, omit this step. Et, voila! Homemade hamburger buns – perfect for your gourmet-style hamburgers.